Originally designed by architect Willis G. Hale and constructed in 1892 as the Lorraine Apartments, the building was renamed the Lorraine Hotel in 1948 after being acquired by Father Divine, leader of the Divine Peace Mission Movement. The building served as the Peace Mission’s headquarters for international religious, civil rights, and social welfare activities until its closure in 1999. 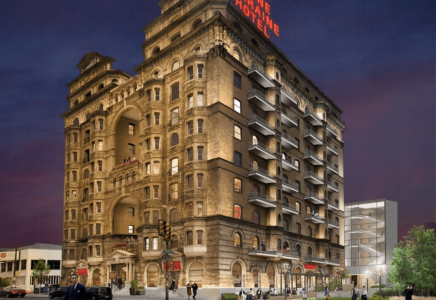 Having been revitalized in 2016, The Divine Lorraine boasts a blend of upscale living with modern amenities. Along with the storied history of a Philly Landmark, residents will enjoy the vibrancy of an area that features close proximity to public transportation, restaurants, shops, and cultural attractions. Residents have access to a rooftop pool, gym, and sundeck located just a block away at Lofts 640. Building units feature large, open floor plans and are finished with sleek industrial touches while maintaining the vintage charm of the Divine Lorraine. The modern kitchens feature top of the line appliances and beautiful light granite counter tops. Let the James ‘Right’ Price Team’s real estate acumen find your new home in this landmark Philadelphia luxury condominium today!